These long-flowering beauties delight in a range of colours. Most gardeners are familiar with the bedding wall-flowers, Erysimum cheiri, used to underplant tulips and other spring bulbs. Their warm rustic tones in shades of red, orange and apricot, via purple and mauve, to yellow and cream help ignite many a seasonal display. While most varieties are used as biennials, discarded after flowering, other types of erysimum continue to perform for three or more years extending their value. They also flower over a long season, variously from spring into summer, or summer through to first frosts, with robust variety ‘Bowles Mauve’ never seeming to draw breathe. The flower-heads of many also change colour as they age or fade, creating a striking two-tone effect. While some are sweetly scented, others are not, but all make excellent bee plants, providing a rich source of nectar. Trim off spent flowers after flowering to encourage fresh new growth. 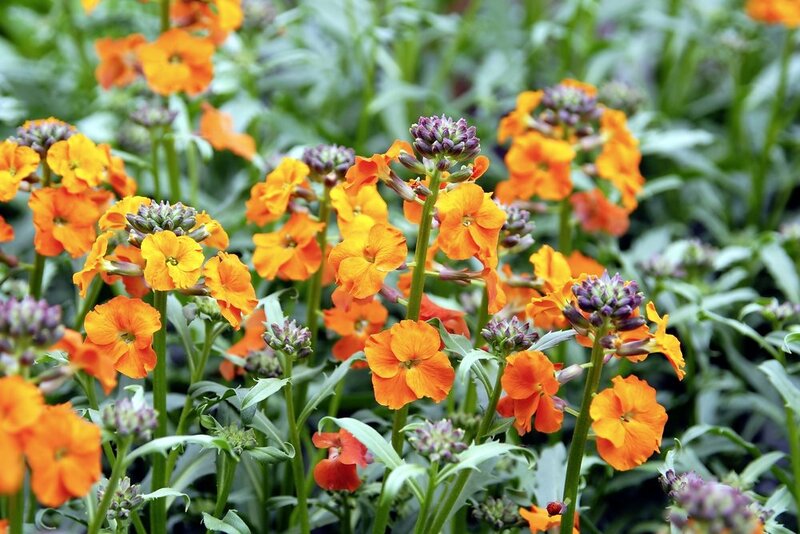 Derived from a broader range of erysimum species than standard bedding types their growth habits range from spreading mats to hummocky shrubs. All have the tell-tale four-petalled flowers that belie their brassica or cabbage-family heritage. They perform best in well-drained, poor soil preferably on the chalky side, in full sun, and in an airy position. Wet soil will cause them to rot, and while a rich diet of fertiliser might hasten growth, it shortens their life. As cabbage relatives they prone to club-root, which is less prevalent on limed or naturally chalky soil. They are ideal for growing in stony soils, along with other Mediterranean plants, and being salt-tolerant, are also ideal for coastal situations. They also perform well in pots of compost, with extra grit or perlite added for drainage. Propagate specific varieties from cuttings of young shoots taken in late spring to early summer. Left untrimmed varieties such as Bowles Mauve will self-sow, yielding a constant supply of fresh, new stock.